Forum Index > Historical Arms Talk > 'Brass knuckle' studded hand guards on smallswords/daggers? Posted: Wed 25 May, 2016 1:17 pm Post subject: 'Brass knuckle' studded hand guards on smallswords/daggers? Many of you are likely familiar with the WWI trench knife. While many swords and a few daggers had D-guards to protect the hand, this is different. Since this kind of guard is designed to work as a 'knuckle duster' it must be far stronger to take the force of a full-power straight punch to an unyielding target without collapsing the guard on the hand of the user. It also is usually studded or 'toothed' on the outside radius to enhance the effect of the blow. So my question is, are there any examples of Medieval or Renniasance swords or daggers with this 'brass knuckle'-style handguard? The only example that comes to mind is the Chinese hook sword, and I don't know if that's as old as Renaissance. Perhaps as early Ming, comfortably Medieval, but hard to say for sure. I know early metallurgy would make constructing such a guard more difficult, but it should be well within the capabilities of a master weaponsmith even earlier on. I am surprised nobody seems to have done it. Firstly the trench knife is a close-quarter weapon that doesn't significantly increase your reach, whereas to use the sword in an unarmoured context, you will probably want to stay at around what renaissance fencing instructors referred to as wide or large measure - unless your opponent rushes in, perhaps to grapple, and you can't otherwise counter in time. In short, you shouldn't need to use your sword guard as a knuckleduster all that often. Further, the guard of the trench knife (and the weapon as a whole) is a relatively light affair, so it might have been considered worth adding the ridges to increase its offensive potential. 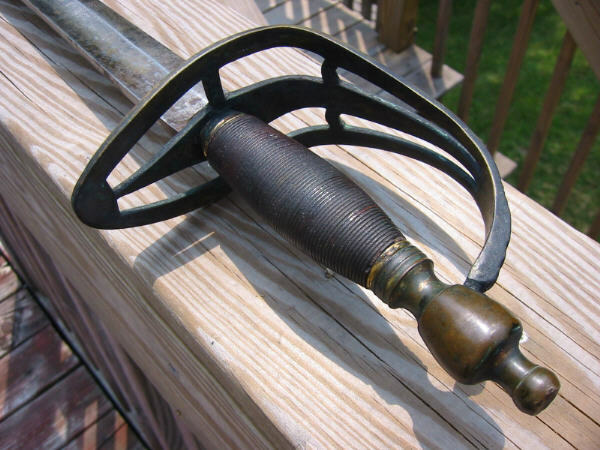 A basket hilt or even knuckleguard on a military sword is usually quite a bit larger and consequently heavier, so if you punch someone in the face with it, they're going to know they've been punched. There are some 17th century schiavonas which have decorative rivets on the baskets, but these are ornamental; silver or silver-plated if I recall (i.e. soft) and any enhancement to the basket's effectiveness as a knuckleduster is almost certainly unintended. 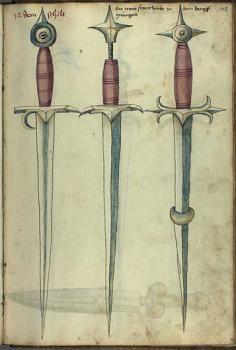 In a similar fashion in the early renaissance, there is a technique of striking armoured opponents with the pommel (mordschlag), and there are a few German fencing manuals which advocate using longswords with spiked pommels for this (during judicial duels) but most others show the technique as working just as well with ordinary pommels of the sorts found on virtually all surviving swords from the period. Clearly it was thought about, but wasn't generally considered worth the effort. If you're not limiting your inquiry to just European/Western weapons, then you've got the Hawai'ian, Micronesian & Polynesian "knuckle duster." 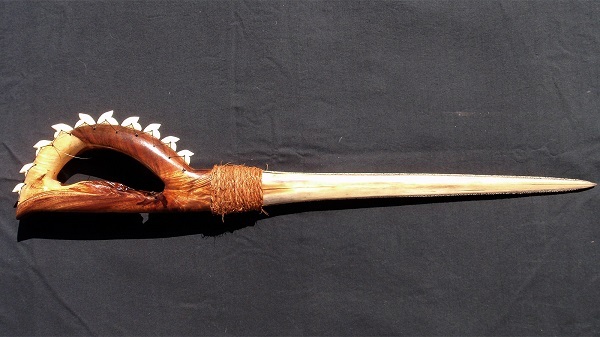 The Pacific cultures did not have iron before Western contact, so generally these lei-o-mano (shark's lei) weapons were made with hardwoods like kauila, milo or koa; swordfish spikes; coconut cord; and tiger shark teeth. Cook had first contact with these people in the 1700s (and they killed him because of his Euro-centric ignorance and arrogance) but there is no reason not to believe that these weapons were present during the pre-contact era as well. There are also hilts for swords as shown in Vadi illustrations and numerous blow techniqes with simple and compound hilts with side rings, what have you.. I'm not sure why you think making something like this would have been difficult historically. It seems quite easy compared to all sorts of metal work that was common throughout history. 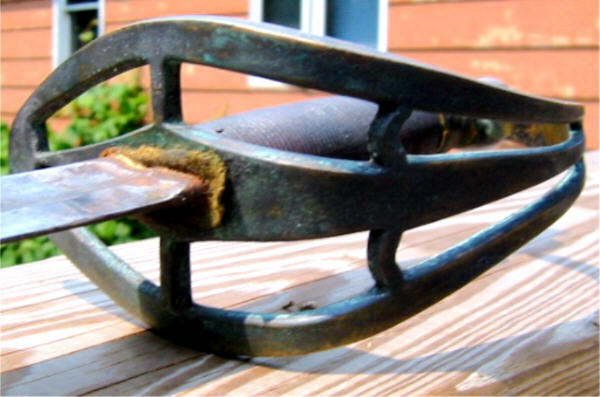 Think about the work that went in to making something like a bronze Corinthian helm or even a "Viking" axe (much more complex than most realize). It must not have been common because nobody felt the need for it. Personally I would much rather have a basket hilt on my sword than a simple spiked D-guard. Some of the lighter officer swords of the 19th century have some elements that could be considered hurtful. I have one such, on a later eagle pommel. While I have that folder open, here is an even more ouchy example (likely for the user as well). Sweet blade! I have never seen a basket hilt nearly that beefy. My Cold Steel cutlass has a heavy steel basket guard, but that is a repro of a 20th century sword. I did not know earler basket hilts were sometimes that heavily constructed. Thanks for the informative reply! Though it is somewhat heavily constructed, I would be skeptical it would be strong enough to survive a couple full-power punches to an adversary's face. Still, the intent appears to be there in the design. Remember that the guard is stronger when it deflects the force of the blow, which also decreases the shock to the hand. A longer weapon hitting that spiked guard would probably redirect your hand in a disadvantageous manner. I admit that I can't back this up with any sparring experience of my own, but it fits with what I've been reading about 19th C sword design. I had not thought of that, and it makes perfect sense. I guess such a guard would only be useful on a fighting knife or dagger (but not a parrying dagger). Remember that a sword like that is a gentleman's weapon: Someone able to afford a sword like that would have been able to get it repaired as necessary should it be called upon to exceed its limitations.. You would not expect to need to 'rough and tumble it' and indeed to do so would detract from your status (this sword, whilst still a practical weapon, is very much about status). Should you find yourself cornered by roughians and need to use it, you would have been taught to use the blade; in extremis if they close too quickly and you had to punch with the hilt, it would survive enough blows to get you clear, then later you would have the hilt mended/replaced (or perhaps they would overwhelm you, rob you and leave you for dead). It comes down to combat style. the idea of pommel strikes or punches in sword combat is mostly a hollywoodism . If your opponent is so open you can deck him with your basket hilt you can probably just stab him or at least give him a harrying cut to the face or neck. Especially with small swords and rapiers. If you're close enough to be able to punch the guy then it's devolving into ground combat or both parties breaking away to proper distance. Things like BOTN hand pavises people corner bash with is due to the rules of the combat sport (3 limbs on the ground=out). In reality if you aren't using a 2h poleaxe. cut down lance, or 2hand sword you probably have a thrust oriented dagger on your hip or in your off hand as seen in most woodcuts from surviving combat manuscripts and you'd be aiming for armpits, groins, and necks. First you have a sword, so why'd you need to punch a guy? A second item note is that people had more armour, try to punch a man wearing Bevor or Hounskull in in the face, even an open helm like a Barbute or a Late Roman ridge helmet, all you get is dents and anger. The blunt impact of a fist is not all that well able to stop people, look at any boxing match or MMA fight, men take dozens of blunt blows to the head to little effect. Well, in boxing that's largely an unintended consequence of the padded gloves, and actually detrimental to the fighters' long term health. In sports with lighter and harder hand protection, like most MMA promos, squarely connected punches to the head tend to end the match very quickly, even immediately; it's just that, because of this, successful fighters in those sports are necessarily adept at not letting punches land square on - they don't tank full-on blows to the face, they just avoid them as much as possible. And in bareknuckle boxing (and actual fights) the absence of hand protection makes punches at the jaw riskier for the puncher than the punchee - it's a great way to break fingers and/or cut yourself - so you mostly aim for the nose and the sides of the head, instead (or at least you should). A knuckleduster protects your fingers, makes your fist heavier, and hits with a smaller and harder surface area, all increasing the effectiveness of your punch, and if you know how to punch it's already enough to take a man out of the fight even on its own (at least if they don't see it coming; if they do, it's more of a crapshoot). But, of course, with a sword or dagger the sharp blade is way more effective and more efficient in almost any situation. Fiore disagreed and included them in his giocco stretto, somewhat predating Hollywood.